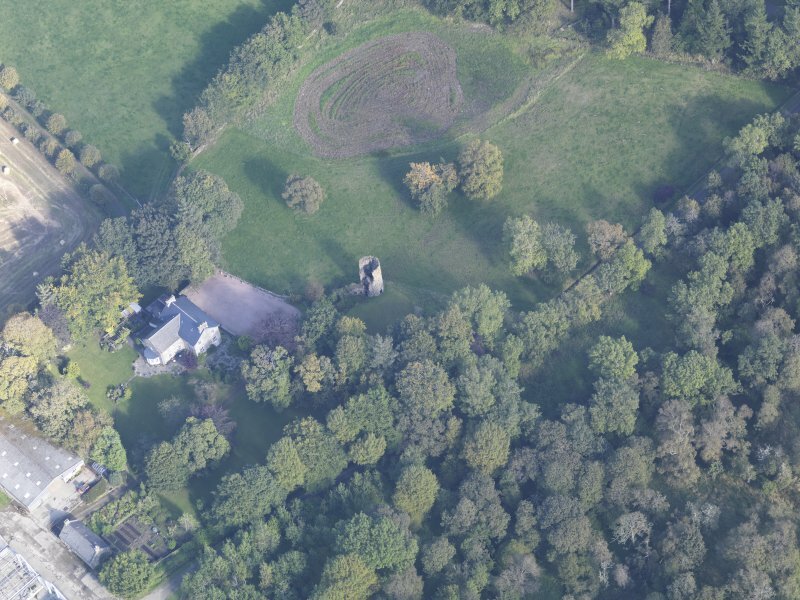 Oblique aerial view of Asloun Castle, taken from the SE. 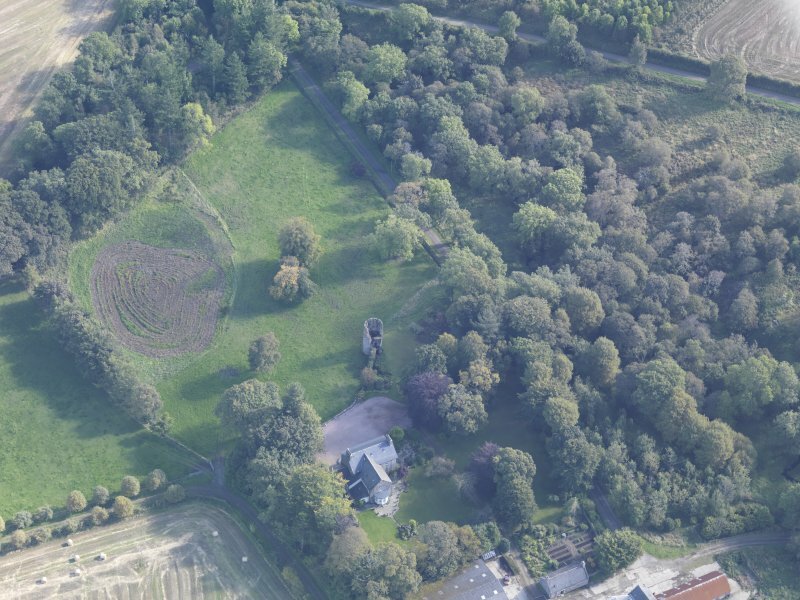 Oblique aerial view of Asloun Castle, taken from the WSW. 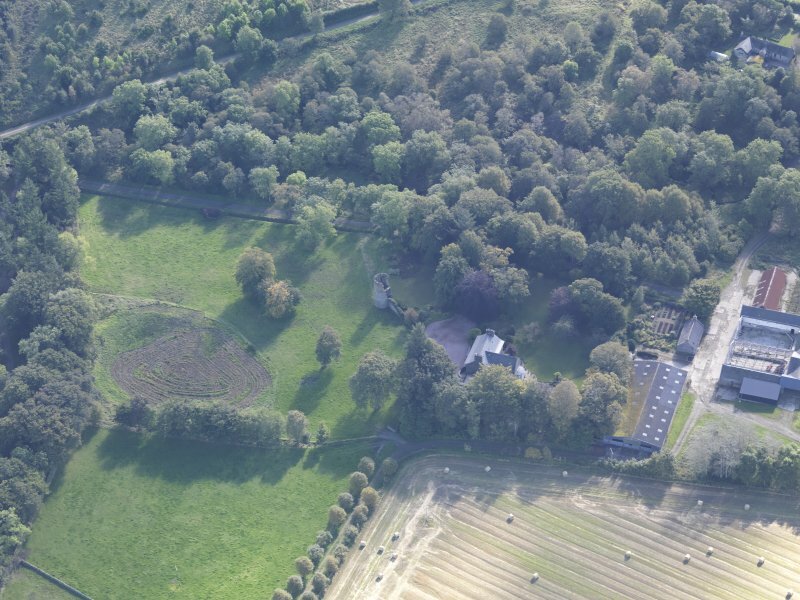 Oblique aerial view of Asloun Castle, taken from the WNW. Oblique aerial view of Asloun Castle, taken from the E.
Oblique aerial view of Asloun Castle, taken from the SW.
Oblique aerial view of Asloun Castle, taken from the S.
Oblique aerial view of Asloun Castle, taken from the NNW. 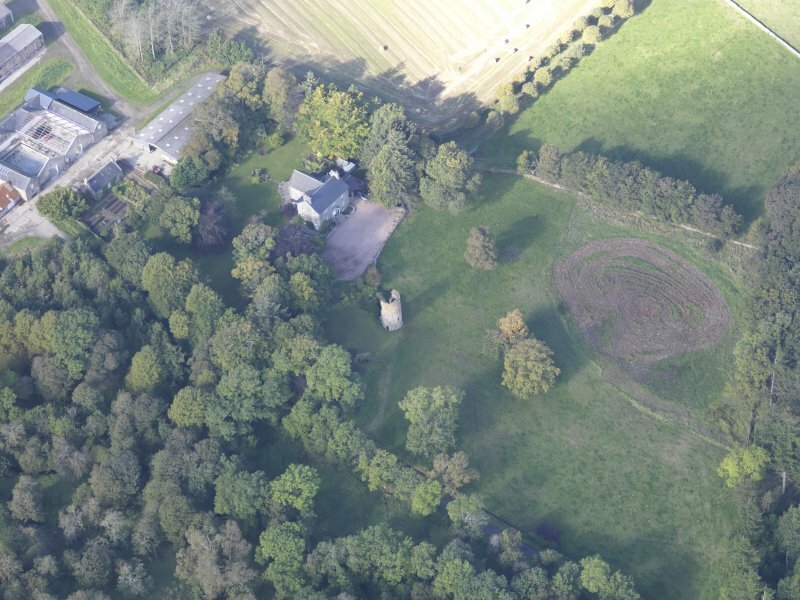 Castle of Asloun: 'We lay at Leslie all night, they (Montrose) camped at Asloun: 2 July 1645'. 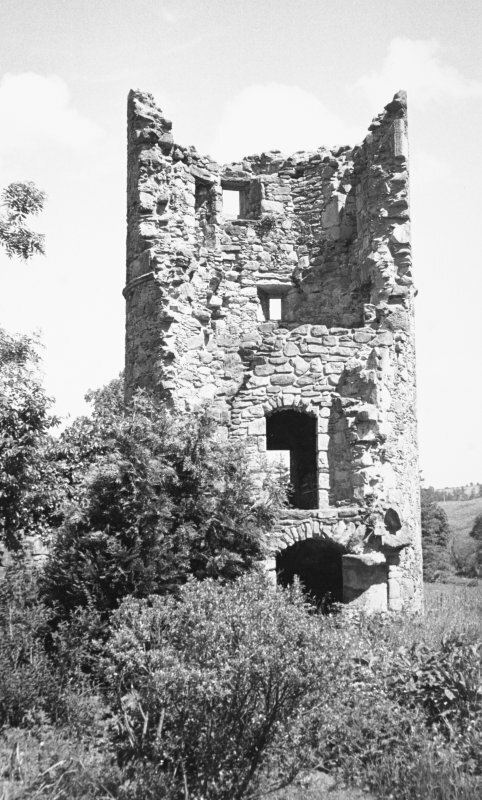 A Calder then Forbes Z-plan castle now reduced to the remains of a single tower, guarding entrance to large modern farm. 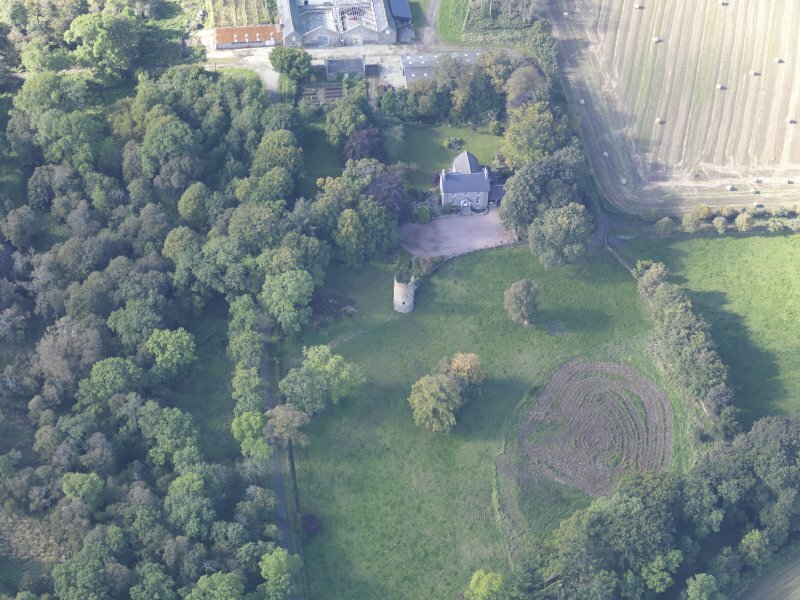 Asloon Castle was a Z-plan castle, extant in 1638 (Laing 1828) and 1645 (Simpson 1921) (Montrose slept there the night before the Battle of Alford). There is a dovecot at Asloon House (Robertson 1957). W D Simpson 1921; D MacGibbon and T Ross 1887-92; A N Robertson 1957; A Laing 1828; OS Reviser D Davies 27 June 1955. One round tower and c.8.6 metres of walling extending NW from the NW side of the tower are all that remains of Asloun Castle. The tower is three storeys high, with an entrace on the S side. The wall is c.4.0 metres high, with two gun loops apparent close by the tower. The remains are being restored by the present owners. 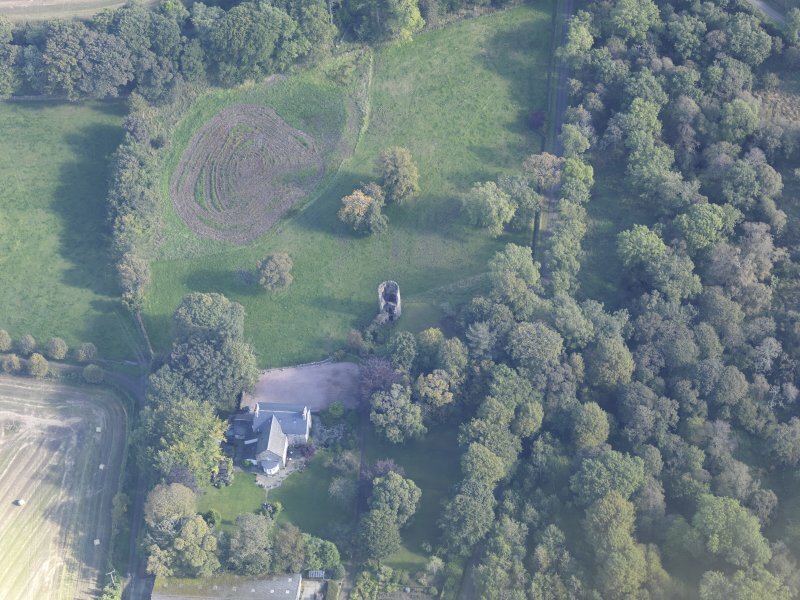 There is no local knowledge of a dovecot at Asloun House and it could not be found during fieldwork. Visited by OS (RL) 10 September 1968. This ruinous Z-plan tower-house is situated in the front garden of Asloun House. 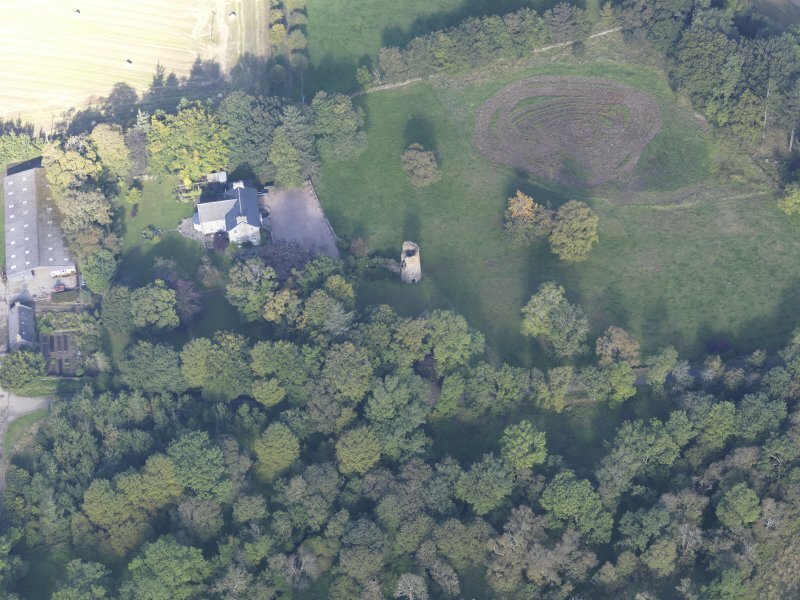 It has been reduced to a substantial portion of a round tower, which formed the SE end of the building, and a fragment of the NE side of the hall. The ground-floor of the hall was stone-vaulted and lit by slit windows. There appear to have been window openings at both ground- and first-floor levels in the return between the tower and the SE end of the hall block, of which that at first-floor level has holes for a iron-grill. The principal entrance was through the tower, which also provided access, via a turnpike stair, to the first floor. Round gun-loops are visible in the basement of the tower, and the openings in the tower are decorated with quirked roll-mouldings that date the castle from the mid-16th to the early-17th century. The upper floor of the tower, indicated externally by a roll-moulded string-course, appears to have provided private accommodation, accessible only from the main body of the castle, with a larger window opening to light it. There is a recess for an armorial over the entrance and another above a slit window at first-floor level. Although both armorials have been removed, it is likely that the lower recess was occupied by the arms of the occupant and the upper by those of the feudal superior (I Fisher, pers. comm.). Air photographs: AAS/92/01/S2/6-9, flown 20 February 1992. 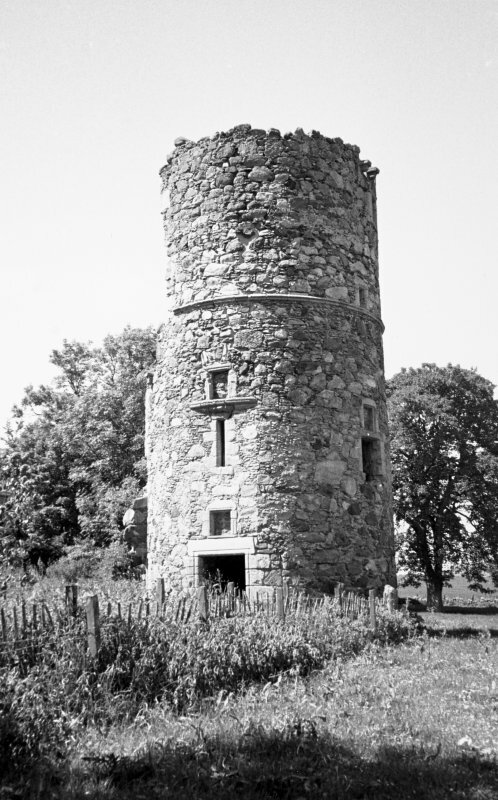 A Niven Robertson (page 366) (copy in PA229/18/7) states the tower is 'said to have been a dovecote' but found no signs of former pigeon holes.